Real Madrid are involved in Monday night football in the Spanish League as they face a resurgent Leganes team. Zinedine Zidane and co have an immediate aim to finish as high as possible in what has been a disappointing season. A win will put pressure on Atletico Madrid who are consolidating their second spot while Leganes will be pushing into the top half with a victory. For a team that was struggling in the lower realms of the league for a long time, their growth has been remarkable. The last time these two sides met, the game ended in a thumping 4-1 win for the Los Blancos. Leganes vs Real Madrid Live Football Score. Kenneth Omeruo is a doubt for the home team after suffering from a knock. The defender is a key player for his team and helped them win 1-0 in a Copa Del Ray game against their famous opponent. Javi Eraso the chief playmaker of the team needs to have a good game in the centre and create a few chances for his frontman - Martin Brathwaite and Carrilo. Ivan Cuellar can expect a busy game between the sticks for Leganes against some of the best attackers in the world of football. The Los Blancos will be without skipper Sergio Ramos who is nursing a calf injury. In his place, Spanish defender Nacho should start while Keylor Navas is also certain to be in the line-up with Thibault Courtois ruled out. Karim Benzema has been getting the goals for Madrid and he will once again be their go-to man up top. Casemiro partners Luka Modric in midfield to make a very strong Real Madrid team. Real Madrid have too much quality and they will have little problem in dispatching Leganes. 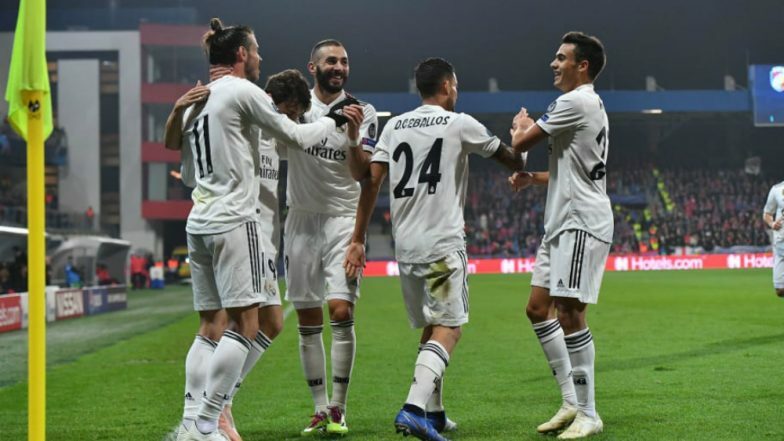 When is Leganes vs Real Madrid, La Liga 2018-19 Football Match Schedule (Date, Time and Venue Details)? Leganes and Real Madrid lock horns against each other in the La Liga match on April 16, 2019 (late Monday night). The Leganes and Real Madrid football match that will be held at the Estadio Municipal de Butarque. It will kick off at 12:30 am IST. How to Watch Live Telecast of Leganes vs Real Madrid, La Liga 2018-19 Football Match? Sony Pictures Networks holds the broadcast rights of La Liga in India. So, the Leganes vs Real Madrid match will be live telecast on Sony Six and Sony Six HD channels. If you are unable to watch the match live on their TV sets, you can catch Leganes vs Real Madrid match online via live streaming on Sony Liv app as well as on La Liga's official Facebook page. You can also live football score updates on LatestLY here.